The program originally called Global Monitoring for Environment and Security (GMES) and later Copernicus is intended to create an autonomous system of territorial control through a constellation of satellites that have different functions. The first Sentinel satellite was launched in April 2014 to open a new era in Earth observations from space. The Sentinel-2A satellite is equipped with a multispectral camera that captures images in 13 spectral bands ranging from visible light to short-wave infrareds. It has a 290 kilometers (180 miles) swath to provide a control of the territory at a very advanced level. The mission of the satellite Sentinel-2A continues to some extent the program of the SPOT (Satellite Pour l’Observation de la Terre) satellites started in the ’80s by France along with Belgium and Sweden. It will also work side by side with the American Landsat missions. Thanks to the highly advanced design of its multispectral camera it will provide images of a very high quality, well above those of other satellites of this type. The acquisition of images of the territory by the Sentinel-2A satellite has in particular the aim of monitoring vegetation, soil and water, which also means crops. It will improve land mapping to assess more accurately the breakdown of the various areas, from the use of land to forests but also of geophysical changes. This type of monitoring will be useful to contribute to the Copernicus program about issues such as climate change and the management of environmental emergency and safety. The Sentinel-2A satellite will be able to revisit the same territories every 10 days. After the test period, the Sentinel-2A satellite will begin its mission, which has an expected life of 7 years. Its orbit, which has an altitude of 786 kilometers (488 miles), is sun-synchronous, which measn that it alwasy flies over a certain area of ​​the Earth at the same local time. 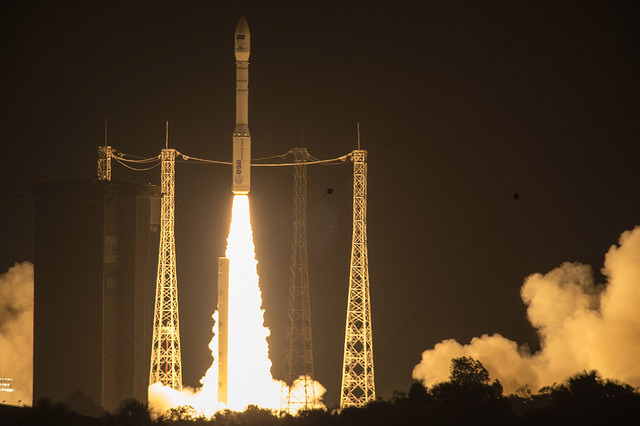 Next year the launch of its twin satellite Sentinel-2B is scheduled but over time other satellites in the Copernicus constellation will be launched with various instruments to further improve the monitoring of the territory.